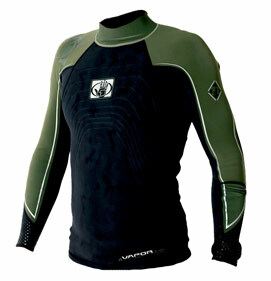 Wetsuit top is similar to rashguard. The difference is that is is made out of neoprene usually 1 millimeter or 1.5 millimeters thick and it will keep you warm in the summer if the water is not quite tropical or if there is wind, clouds or any other kind of bad weather. You can also wear it under your full wetsuit when the water gets colder. The normal temperature range for a wetsuit top is somewhere between 72F–77F (22C-25C). Wetsuit top also usually has flatlock stitches that are not waterproof. It is usefull that it has some sort of tightening system on the bottom because wetsuit tops like to slip up while you are surfing and that gets pretty anoying. Another version of wetsuits top is a wetsuit vest.